A pioneering oil-infused treatment for all hair types. Combines conditioning styling & finishing effects in one. Instantly reduces frizz & completes the hair look. 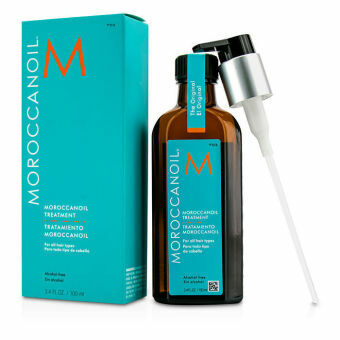 Moroccanoil Oil Treatment for Hair is an ultra-light serum with instant absorption into hair to create a beautiful shine and long term conditioning. For hundreds of years Argan oil has been used by women in Morocco to treat hair and nails in order to counteract the effects of the hot climate. The Argan tree, found only in the South West of Morocco called Argana; blossoms in the desert-like conditions and produces fruits much like olives yet larger and rounder. Inside the fruit grows a large nut that houses up to three almond-shape kernels which are the source of this miraculous oil. Before applying color, massage approximately 5ml of Moroccan Oil Treatment to hair. This will enhance the hairs ability to absorb the color.